✔ SAVE ENERGY - MAXIMIZE OUTPUT - Cut down your electricity bill by up to 75% when replacing 400W with 100W. The 12000-lumen light output provides an incredible bright lighting to your space with a staggering 120lm/watt! 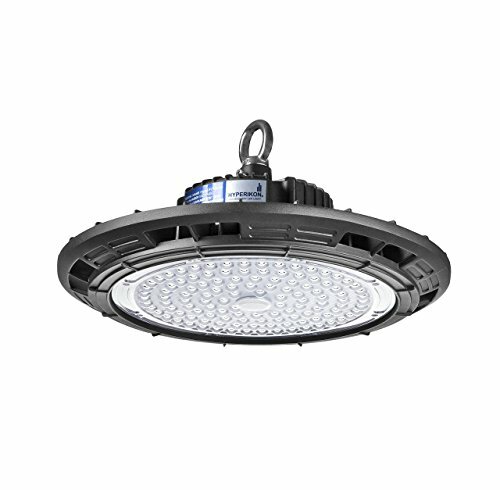 ✔ HIGH PERFORMANCE - The 100W high bay UFO light is a UL classified product to ensure the highest safety to our customers. No more hazardous UV Mercury when you replace your old metal halide and high pressure sodium fixtures! ✔ COMPACT DESIGN - The Hyperikon UFO High Bay LED packs the power of a full high bay fixture into a lightweight, yet robust and durable fixture measuring just 12 inches across. The design of this product allows you to replace heavy hanging light fixtures in your application! ✔ EFFORTLESS INSTALL - Simply hang the UFO High Bay via the included ring attachment in the desired location! Use the included instructions to wire the light to power for amazingly bright light. ✔ 5 YEAR WARRANTY - We remove the risk to ensure your satisfaction. Hyperikon's five-year unlimited warranty got you covered! Contact us for an easy and fast replacement. If you have any questions about this product by Hyperikon, contact us by completing and submitting the form below. If you are looking for a specif part number, please include it with your message.